When you were a child did your family take seaside holidays in the UK? If so you will undoubtedly have recollections of visiting seafront cafés. My memory of them is making hurriedly for the nearest one when the rain arrived; deckchairs were quickly abandoned and off we would set, carrying bags, pails and spades, and various other items deemed essential for a day on the beach. Upon reaching the shelter of the café it was invariably already packed with customers. Those that had secured a table before the downpour started were reticent to vacate their tables for the newcomers, even though they had finished their meal: making a pot of tea last for an hour is a perfected art among British holidaymakers. The mixed odours of wet Pac-a-Macs, suntan lotion and, in those days, cigarette smoke, filled the café; there was usually at least one screaming child to add to the misery. A soaking wet dog would be tied to the railings outside and after about twenty minutes standing out in the rain it would become so fed up it would start to bark intermittently. Then, as quickly as they had arrived the clouds would clear, the rain gradually stop and the sun would stream through the windows. The mood in the café would change and acting almost as one the occupants would gather their belongings together and start to leave. As quickly as it had been filled, the cafe now steadily emptied as everyone headed back for the beach. Thankfully seaside resort cafés have come a long way since those days. Interiors are greatly improved, as is the service and the food. Yes, it is still mainly plain fare, but what else would you ask of an English seaside café. Cromer is lucky in that there are one or two that are worthy of mention. 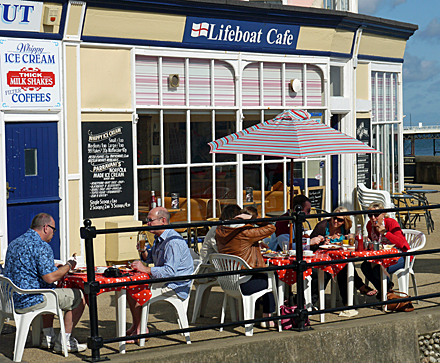 The Lifeboat Café is at the bottom of The Gangway opposite the RNLI Museum and the Rocket House Café. There are several tables outside that can be in great demand when the sun shines. If you arrive early you can breakfast while the crab boats are landing and watch the fishermen sorting the catch. There are regulars that make a point of arriving early to secure a table for the excellent breakfasts that the café serves. For lunch there are delicious Cromer crab salads and sandwiches if you prefer. A selection of cakes and lashings of tea are available in the afternoon. To sum up: the Lifeboat Café serves very good food and drink. The interior is kept to a high standard and the setting is ideal. 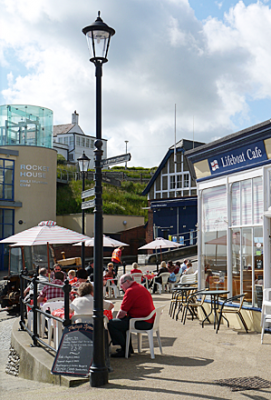 What more could you ask of an English seafront café?